Synopsis: Several months after the events of Captain America: Civil War, Peter Parker, with the help of his mentor Tony Stark, tries to balance his life as an ordinary high school student in Queens, New York City while fighting crime as his superhero alter-ego Spider-Man as a new threat, the Vulture, emerges. No one would fault any moviegoer for saying that they have Spider-Man movie fatigue, with five films having been released in such a short span of time. And with Spider-Man: Homecoming hitting theaters this weekend, there’s no doubt some will dismiss the latest comic book release simply because it features a familiar character. But to do so would be a huge mistake, as Spider-Man: Homecoming is easily one of the best Spider-Man stories put to film, functioning as both a great comic book action film and a coming of age story. 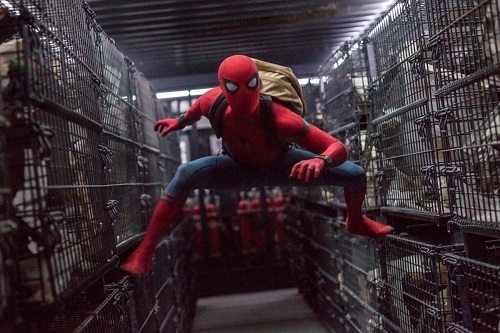 By now you should be familiar with the premise of Spider-Man: teenage highschooler Peter Parker (Tom Holland) has been bitten by a radioactive spider, which gives him numerous powers. Luckily, Spider-Man: Homecoming skips past all of the necessary setups for the Peter Parker story and picks up with the character as a rookie crimefighter fresh off of a dazzling debut in Captain America: Civil War. While past Spider-Man stories have tried to balance Peter’s high school life with his superheroics, Spider-Man: Homecoming feels like the first film to really nail that dichotomy. The film wants to make sure audiences know that it’s just a kid underneath the amazing spider suit. He’s prone to mistakes in his personal life and his professional life. However, when Peter is faced with a growing threat in The Vulture (Michael Keaton), he is desperate to be the one to save the day. Even if his more accomplished friends, like Tony Stark/Iron Man (Robert Downey Jr.) should get involved. Peter is learning and growing as Spider-Man just as much as he is as a young man, and oftentimes that means making a lot of stupid decisions. It’s refreshing to see this side of a character that up until now has been somewhat one-note, and in a way that differentiates him from all the other comic book heroes on film right now. As is expected from a Marvel Studios production (the first Spider-Man film to have that honor), the action in Spider-Man: Homecoming is exceptional. Fans can expect to see Spidey in all of his signature poses, with plenty of quips for bad guys, and with some cool new gadgets to boot. The film even finds humor in showing Spider-Man as a novice – he’s not a perfect webslinger at this point in his career and the movie never shies away from that. Alongside the Spider-Man elements, Spider-Man: Homecoming lets Peter be a teenaged high school kid as much as possible. That side of the story may be a bit cliché but it has a great heart to it and is well paced. Holland brings so much exuberance to the role of Peter Parker that it’s hard not to enjoy watching him in a Hughes-esque coming of age story. It also doesn’t hurt that the film fills out its cast with young kids that are not just high school bit parts. Simply put, Spider-Man: Homecoming is the complete package when it comes to an adaptation of the comic book character. It delivers all of the webslinging action that fans could want, with creative sequences, a great villain, and sharp visual effects. And on the flip side, its Peter Parker storyline has a great heart and never leans too far into the high school clichés. The film is Spider-Man on the big screen as he has been in comic books for decades, but more importantly, it’s just as enjoyable no matter how familiar you are with the source material. Five films in, it’s hard to imagine that Spider-Man: Homecoming would be capable of delivering action that wows, and smartly, director Jon Watts seems to know that. 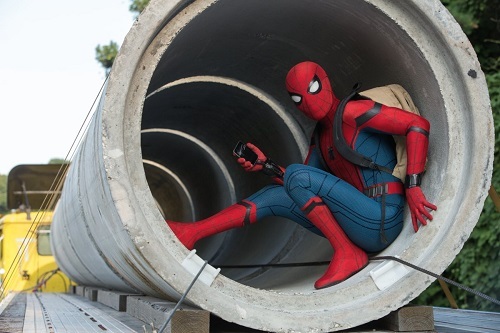 Rather than go for a film that’s overwrought with bombastic action sequences on a massive scale, Spider-Man: Homecoming keeps a lot of the film small in its scope. There are some moments that are truly impressive, but the most memorable involve Peter Parker trying to be the best Spider-Man he can be despite a lack of experience. There’s also a great comedic interplay in the action that feels appropriate for the character. You can see the natural progression of Spider-Man as a hero and you begin to see his evolution into the character that eventually swings between skyscrapers in Manhattan. But for now, he’s better suited for zipping through the suburbs while breaking a few fences along the way.